"'Tis true; 'tis certain; man though dead retains Part of himself; the immortal mind remains." 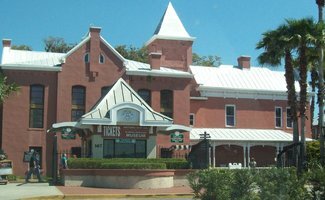 Many signs of paranormal activity have been reported at the structure known as “The Old Jail” in St. Augustine, Florida. The reports have been so significant that we have elected to devote this page to the structure and detail the ghost facts that surround this haunted jail. Founded in the year of 1565 by an explorer named Pedro Menendez de Aviles, St. Augustine is often referred to as the “Nation’s Oldest City”. Many locals in the region also refer to it as the “Ancient City”. The city’s past is considered to be both colorful and exceptionally violent. By day, you are able to step back in time and catch a glimpse of the city’s history. By night, you are able to step into a world of shadows and mysterious ghost lore. You may even catch a glimpse of one of the many spirits that are said to haunt the city. Several structures and sections of land are rumored to be haunted. One of the most popular haunted places is the Old Jail. In this guide on haunted places, you will learn about the signs of paranormal activity that have been associated with this building. The Old Jail was constructed in the year of 1891 due to the donations offered by the popular Henry Flagler. He made a point to construct the jail at San Marco Street because, at the time, the jail for the city was located across from his hotel, known at the time as the “Hotel Ponce de Leon”. Today, it is known as Flagler College. Since he served many high-class clients, he felt that having a jail immediately across from his world class hotel would not be productive to his business. In addition to the actual jail, he also donated money and materials to construct the building that is adjacent to the Old Jail. This is the same building that would eventually become the lodging space for the local sheriff. At the time, no one would believe that, eventually, many locals and visitors alike would claim that many signs of paranormal activity would take place in and around the structure. Today, the Old Jail is one of only a few jails that are still standing from the nineteenth-century. Flagler made a deal with the Pauley Company to construct the facility. This company was chosen because of the fact that they were known to possess the capability of constructing jails and prisons that were highly secure and were considered to be technologically advanced for the time period. One of the most notable prisons constructed by this company is Alcatraz. In total, the Pauley Company charged nearly eighteen thousand dollars to build the Old Jail in St. Augustine. The outside of the structure was built to reflect the finest Queen Anne architectural layouts. In addition to this, the brickwork reflected the Victorian style. The inside of the building included cells that were highly secure, an amazing locking system, and enough space for approximately seventy two inmates. It was advanced for its time. However, it still was not known that, eventually, many would relay stories of signs of paranormal activity and others would investigate the ghost facts surrounding the facility. In order to understand why there may be so many signs of paranormal activity in the Old Jail in St. Augustine, Florida, it is important that you gain an understanding of the conditions that the inmates faced when they were confined in the facility. While the structure was highly appealing to onlookers on the outside of the jail, the structure was not at all appealing to those that were ordered to serve time in the jail to compensate for the crimes that they had committed as citizens. The men had three different floors of the prison that held cells. They were in the center of the structure. This area was typically protected from the environmental elements but could be exceptionally warm or cold – depending on the external temperature. The women’s area was on the ground region. Unfortunately, their cells were not protected from the environmental conditions. In addition to this, they were also frequented by insects, pests, and even snakes. The beds that the prisoners were provided with were constructed of a mattress that had moss and straw inside of it and was known to attract many types of insects - specifically, the insect known as the “Red Bug”. The prisoners were unable to bathe because of the fact that there was no water and no sewage present on the grounds. Furthermore, the individuals confined in the facility only had the one set of clothes that were on their back. Prisoners were provided with one bucket of water per cell – which often consisted of four prisoners total. As you can imagine, there was a high level of sickness and despair due to the high level of germs and massive detriment as far as the prison conditions are concerned. Many paranormal investigators feel that the signs of paranormal activity that are often reported in the apparent haunted jail stem from the emotional despair and grief that the prisoners must have experienced in life. •	Many individuals claim that they hear the sounds of dogs barking around the structure. According to reports, the Sheriff that was in charge of the structure during operation – Charles Joseph Perry – used his dogs in order to control the inmates within the jail. •	In what was once the area where women were confined in the jail, many individuals have encountered what appears to be a relatively angry and potentially dangerous spirit. Many individuals feel the strong emotions upon entering this location. There have been several instances where individuals have been forcefully pushed or intentionally tripped by an unseen force while in this area. •	Many of the tour guides have experienced signs of paranormal activity while sharing the stories and ghost facts with the guests that visit the Old Jail. One tour guide actually witnessed an apparition that resembled a male figure crouched in a corner. Nearly as soon as the apparition was observed, it stood and seemingly darted through the wall. •	Many individuals have heard what is often described as an “evil laugh” while within the structure. •	Most that have worked or frequented the structure often claim that they always feel as if there are others in the same vicinity as them, but there is no visible sign that anyone else is present. •	Many people claim that they hear noises such as moans, crying, and even chains dragging while in or around the building. There are several ghost facts surrounding the Old Jail in St. Augustine, Florida. If you have an interest in signs of paranormal activity, ghost hunting and other paranormal related stories, you should visit this museum. By day, the history is retold and by night, the stories of the spirits of the structure are provided to guests.